Abrupt average temperature changes of as much as 4 or 5 degrees Celsius over a few decades may have profoundly affected human civilization for cultures that occupied western Greenland over the past 5,000 year according to a study that used a new technique that measures the qualities of haptophytes (salt-loving microscopic plants). 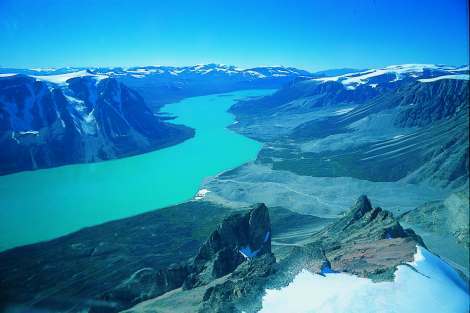 The scientists studied carbon-dated sediment cores recovered from the beds of two saline lakes near Kangerlussuaq, West Greenland, an area north of the two major medieval Viking (Norse) settlements. Haptophytes are common in the ocean and they produce group of compounds called alkenones, a type of lipid. Like the fats in human diets, they're saturated and unsaturated, and the level of saturation depends on temperature. Haptophytes have been used for decades to infer temperature variation in oceans, but only in the last 10 years or so have scientists known that they also occur in salt lakes. The study detailed in PNAS was part of the development of the use of alkenones in researching temperature history in salt lakes. The technique allowed the scientists for the first time to fine-tune their knowledge of climate change in West Greenland — and they found some dramatic changes. The fossil organisms revealed a succession of temperature shifts that roughly coincide with changes in human occupation of the area, including the Saqqaq people (4,500 to 2,800 years ago), the Dorset (2,800-2,000 years ago), the Norse (1,000-550 years ago) and the Inuit (800 years ago to present). 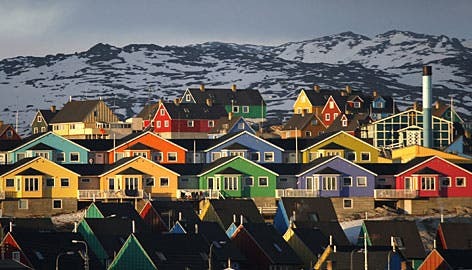 "The research is important because the study has basically described and quantified the temperature variation during the last 5,000 years in this area of West Greenland which has had a fairly rich cultural history over much of that time period," said Fritz, George Holmes university professor of earth and atmospheric sciences. "Some of the changes are quite rapid and fairly large. There's a temperature drop of about 4 degrees Celsius starting about 800 years ago when the Norse were still there, but the reconstruction suggests that within 80 years, temperature dropped 4 degrees during summer months and stayed quite low, so it's quite a large fluctuation. And there are other periods when temperature change was quite rapid and substantial, in the order of 4 to 5 degrees Celsius." Ice cores recovered from the massive ice sheet that covers most of Greenland have provided scientists with a good understanding of hemispheric- and millennial-scale climate variability in the North Atlantic and Europe over the past several thousand years. They've also known that climate change was happening in West Greenland, including the areas where the Vikings settled, but until now, they haven't been able to quantify the specific conditions. The findings are published in the May 30-June 3 online edition of the Proceedings of the National Academy of Sciences. The Daily Galaxy via University of Nebraska-Lincoln.